— especially for my friend, Julie, who has chemo on Mondays. I can’t do anything to ease the suckification of chemo except send off a cartoon that might make you laugh, my sweet. i don’t have any uplifting stories for chemo Monday’s other than the fact that I survived it and am still kicking 26 years later. Maybe this will help. On my first chemo treatment I was in the hospital. They pumped me full of that crap and as they rolled me back into my hospital room I projectile vomited clear across the rooom to the sink. Believe it or not, some of it actually hit the sink. 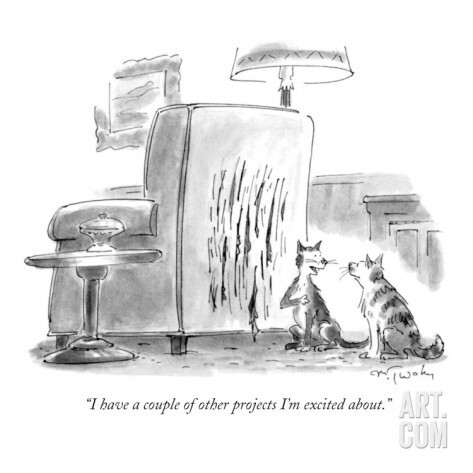 Hahahaha……my cats prefer a contemporary approach to their art work as well!!! Tiger’s medium of choice seems to be hair sculptures which he proudly displays on every piece of furniture I have! Thank you for always sticking such tidbits in my path. 18 inches of snow and -20 windchill spared me from chemo today, but unfortunately at some point they will clear our roads and I will have no excuse to not submit myself. So for today I am relishing a warm fire, a good book and a really witty cat cartoon to share with the girls.